Heavy duty mount with maple clamping block for gas or electric motor. reinforced ash motor mount, clamps to gunwales with easy to use phenolic knobs and stainless hardware. Made exclusively for electric trolling motors. 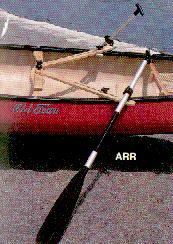 Portable, mounts easily to canoe yoke and gunwales. Can be used with paddles or oars. Ideal for the leisure paddler and fisherman. Oar Locks Carlisle brand sold separately. Dealers; display your canoes at eye level with our folding canvas and ash holders. easy to transport and protects canoe finish. Also used when repairing or restoring.